On 9/11, the world stopped. On 9/12, their stories moved us all. 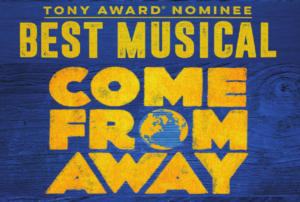 COME FROM AWAY takes you into the heart of the remarkable true story of 7,000 stranded passengers and the small town in Newfoundland that welcomed them. Cultures clashed and nerves ran high, but uneasiness turned into trust, music soared into the night and gratitude grew into enduring friendships. Before the show, enjoy lunch at Mont Blanc 52 in their new location on 52nd Street. The well-known, Swiss-European restaurant is offering a choice of: Chicken Marsala, Filet of Salmon with Capers, Lemon & Scallion OR Cheese Ravioli. Entrees served with Potato Pancakes & Vegetable (except for pasta entree). Apple Strudel a la mode & coffee are included. Fee: $224 per member. Add $10 per person if not a CHS member.